The Wipetect™ Drug Screen Device is based on a competitive immunoassay procedure in which drug derivatives immobilized on the membrane compete with the drug(s) which may be present for limited antibody binding sites on the colored colloidal gold antibody conjugate. During testing, drug residue is collected by the collection pad, and migrates across the membrane when buffer is added. If no drug is present on the surface, the colored colloidal gold antibody conjugate will bind to the drug derivatives on the membrane to form visible bands at specific test regions. Therefore, the presence of a purple-red band at a specific test region indicates a negative result.If any drug(s) is (are) present on the surface, it competes with the immobilized drug conjugate for limited antibody binding sites of the colored colloidal gold conjugate. When a sufficient amount of drug is present, the drug will saturate the antibodies, and the colored colloidal gold conjugate cannot bind to the drug derivative on the membrane. Therefore, the absence of a purple-red band at the test region indicates a presumptive positive result for that particular test. The test is intended to be administered by a trained professional. It should not be used without supervision. This product is intended for forensic use only and is not for use in diagnostic procedures. 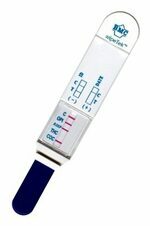 The Wipetect™ Drug Screen Device provides only preliminary drug test results. For a quantitative result or for a confirmation of a presumptive positive result obtained by the Wipetect™ Drug Screen Device, a more specific alternative method such as GC/MS or LC/MS/MS must be used. Remove the test device from its sealed pouch. Carefully remove the blue cap by holding both sides and pulling gently. This will expose the collection pad. Ensure the presence of a blue line in each test window. For drug residue on suspected surface: Wipe the suspected surfaces with collection pad and then add 10 drops of buffer on the collection pad. For drug powder or tablet or plant: Put small amount of suspected solid into the blue cap and then add 10 drops of buffer intothe blue cap. Shake gently for approximately 1~2 minutes, insert the device. Once the blue lines begin to flow, recap the device, and lay on a flat surface. Read results in approximately 2-3 minutes. Do not read results after 30 minutes. The flow of the blue lines indicates the collection of a sufficient amount buffer has been added. If the blue lines are still present after adding the buffer to the pad, have the operator repeat step 4 until the blue lines flow. WipeTect Training Guide (369.35 KB).